In GSM Handoff is known as Handover. Handover is a sophisticated switching technique ,enables a call to proceed uninterrupted when the user moves from one cell to another. Intra BSC Handover: When a mobile or Mobile Station (MS) moves from one cell to another in same BSC , known as Intra BSC Handover . Example : Here when mobile is moving from cell 1 to cell 2 as shown in figure . here you can see that the two BTS are in the same BSC indicating by A so here Intra BSC Handover is taking Place. Intra MSC Handover: When a mobile or Mobile Station (MS) moves from one cell to another in same MSC , known as Intra MSC Handover . Example : Here when mobile is moving from cell 2 to cell 3 as shown in figure . here you can see that the two BTS are under the different BSC's but in the same MSC indicating by B so here Intra MSC Handover is taking Place. Inter MSC Handover: When a mobile or Mobile Station (MS) moves from one cell to another in different MSC which are connected together, known as Inter MSC Handover . Example : Here when mobile is moving from cell 3 to cell 4 as shown in figure . 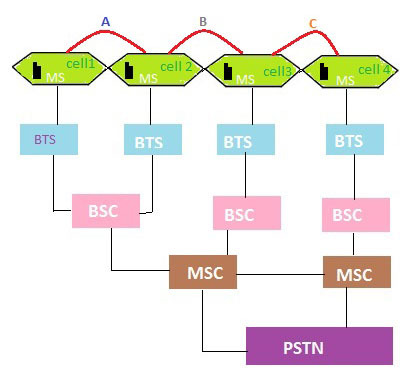 here you can see that the two BTS are under the different BSC's and these BSC's are in the Different MSC's which are connected together indicating by C so here Inter MSC Handover is taking Place.